This episode was based on the short story 'The Tragedy at Marsdon Manor', first published in The Sketch in 1923. It was adapted for television by David Renwick and directed by Renny Rye. There are quite a few significant changes to this one. I'll try to list them in order. 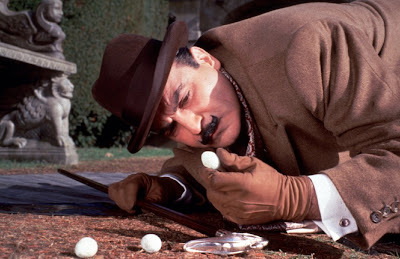 First, the reason for Poirot's involvement is different. Instead of being called down by the insurance company, a local hotel owner wants his help with a crime novel (that particular reason is intially unknown to Poirot), and his involvement with the Marsdon Manor case is mainly a result of two police constables recognising him on their way to the scene of the crime. Second, Japp is added to the story, and he provides much of the information Poirot gets from the insurance company in the original story. Third, the supernatural angle is widened significantly (the story only refers to some rumours of the house being haunted). There's a story of a girl who alledgedly committed suicide from the top of a tree, and Mrs. Maltravers thinks she has seen a face (and seen blood on a mirror, later revealed to have been added to it by herself). Fourth, two suspects are added: A secretary to Mr. Maltravers who had an affair with him years ago (Miss Rawlinson) and Captain Black (who was in the short story, but whose role is greatly expanded here). Fifth, a civil defence meeting is added, in which a seemingly attempted murder of Mrs Maltravers occurs with chloroform in a gas mask. Sixth, a whole list of extra clues are added to the proceedings, including a present wrapped in a newspaper from Nairobi (the newspaper provides the story told by Black in the original), the bird's eggs by the stone bench (evidence that Mrs. Maltravers hid the rifle in the bushes), and a painting made by Mrs. Maltravers as an alibi (the shadows go from right to left, not left to right, so it would have been painted after midday). Finally, a nice subplot with a local wax museum and a wax mask of Mr. Maltravers (instead of theatrical paint) provide some scary and amusing scenes. In sum, then, the episode works quite well, even if the basic plot is restructured. The directing of this episode is particularly good, especially the opening shots of the tree and the floating camera angles (rather like a bird). The locations used include Reepham, Norfolk (the village), the Old Brewery House ("The Red Anchor" exterior), The Bookham Grange Hotel, Leatherhead, Surrey (interior scenes at the local hotel), the Normansfield Victorian Theatre (the civil defense meeting), and Sennove Park, Norfolk (interior and exterior of Marsdon Manor). The soundtrack is good, but not available online or released, as far as I know. No real standouts among the guest actors here, but Geraldine Alexander (Susan Maltravers) and Desmond Barrit (Samuel Naughton, the hotel owner) are quite good. Naughton? He isn't the guy who Poirot eventually kills in his last case?